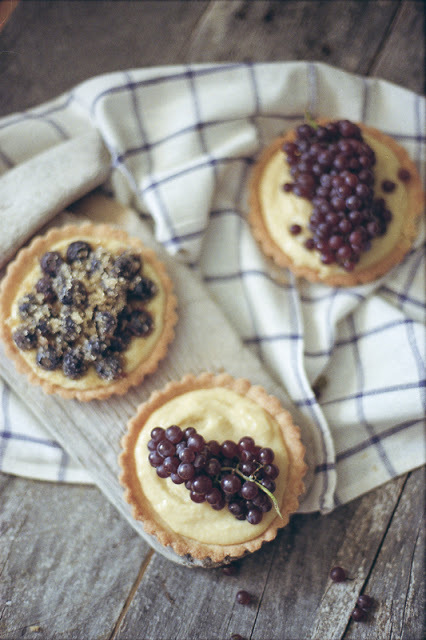 Champagne Grape Tart — always with butter. I went to the little farmers market at Pier 39 when a friend came to visit me in San Francisco. I didn't even know they had a market there. There was not many stalls, really only one person but with a bunch of tables. The fruit they had their was really amazing actually! The cherries were some of the biggest I had ever seen, the strawberries had the steams still on them which I had never seen before in real life. Only in photos did I come across that fresh picked strawberry look. And then I saw Champagne Grapes! I fell completely in love with Champagne Grapes when I was working at a local grocery store years ago and they randomly got them in. I only saw them once their and have never seen them again. They are so small and flavorful, you just grab a whole handful and I didn't even mind that I might have ate a bit of steam. Its worth it. So when I saw them at the market, I knew I had to make something out of them. What better than just a simple little tart with a bunch of fresh fruit on it. The hazelnut pastry cream went well with the grapes, a nice nutty flavor with the sweet fruit. I found the hazelnut extract at a restaurant supply store but I bet you can find it online or at any local specialty shop. Oh dear, so today was my first day where I had to do all the deliveries at the bakery. The boss is on vacation so it was all on me. Driving in San Francisco has always been okay for me, never a real issue but just bothersome. But today driving was pure madness! Two of the deliveries were either on Market or right off of it, which is one of the worst places to drive. There are so many one way streets, pedestrians everywhere and you can only drive on Market for about a block before it makes you turn off it. Apparently only the bus can go straight down Market so what should have been a 7 minute drive from the shop took an hour! And then when I finally found what I thought was a metered parking spot, I parked, fed the meter then ran into the building to deliver the cupcakes. Only to come out after a few minutes to find a 75 dollar ticket! It was a yellow painted parking spot, so I didn't know what that meant but I thought since it had a meter it must be ok to park. Also having like four different signs explaining the no parking restrictions, that were all contradicting each other didn't help either. So not the most successful day but hopefully this next week of deliveries will go better. Oven 350. Five 5” tart pans with removeable bottoms. into bottom & sides of pans. Prick bottoms with a fork. Bake for 10-15 minutes until golden. Let cool completely. pastry cream) & chill until completely cool. or turbino sugar then place over cream.